After 3 1/2 years I finally had to replace my first part on these units. I received an "OE" error code and the washer wouldn't drain. After some research I determined the drain pump had failed and needed to be replaced. They are only $20 on Amazon but I found a local parts store that had them in stock for $38. I installed it today and it's working great. If you find yourself needing to replace the same part, please just tip the washer back 45 degrees and replace it from the bottom versus removing the top and front panels like some people suggest. Let's get started by looking at the laundry detergent dispenser. There's a slot for bleach, fabric softener, and two for detergent. One for pre-wash and one for the main wash. I use a minimal amount of detergent and you'll get better results with a front loader if you do that as well. Once you choose your wash cycle you can add additional options using the touch panel. It's a little bit of a pain that the touch panel isn't entirely back lit, but not a deal breaker. Once you're happy with your selections you can press play or start to begin. Another handy option that I typically use is the custom program. At the touch of one button you can select all your options and then press start. This is much easier if you typically choose the same wash cycle. LG has built a lot of features into this washer to make it very energy efficient. One of the primary ways it does this is through water conservation. Front loaders are already known for being much more water efficient than a traditional top loader. This washer goes a step further. At the beginning of every wash cycle it does a load sensing technique where is jiggles the clothes slightly to determine their weight. It then tosses them around and does another gentle jiggle to determine the weight of the clothes. It then uses this weight to determine how much water to use. For the online reviews that said that this washer barely gets your clothes wet, they're obviously just coming from a traditional top loader mentality. I've been very pleased with the amount of water that this washer uses. Once it determines the size of the load and how much water is needed it will then display the time remaining on the display. Probably the second most common reason that one would purchase this washer is because of its ability to effectively clean the clothes while being very gentle on the fabric. LG accomplishes this using their 6 motion direct drive motor. 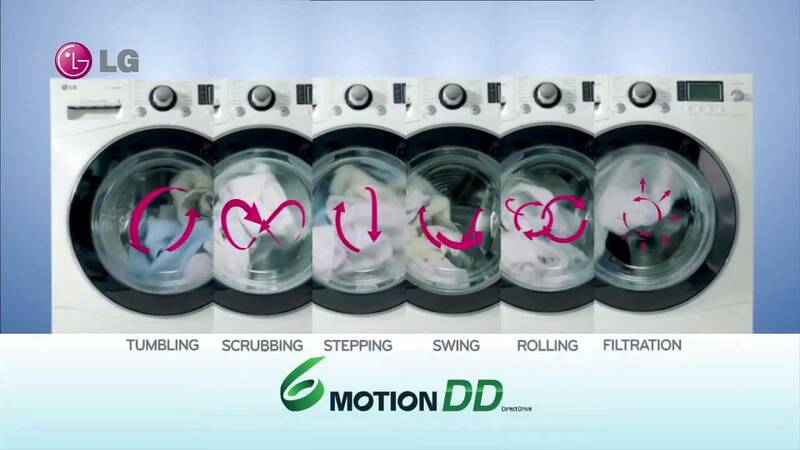 They have six different washing actions depending on the cycle you've chosen. And because there are no belts attached to the motor their able to change directions very quickly. The result is cleaner clothes with less wear and tear, less wrinkling, and less tangling. This is why you buy a front loader. It's so much more effective at cleaning your clothes than a traditional top loader. Now let's take a look at turbo wash. There are nozzles on either side of the drum that spray water and soap directly onto the clothes. The idea is that your clothes are immediately in contact with the soap and water instead of relying on tumbling alone. This option isn't on by default for most cycles and I'm not sure why. I don't know why anyone wouldn't want to get a better wash in less time. But it can easily be turned on from the touch panel and I have it turned on all the time. For rinsing LG uses a feature called atomizing rinse. It uses the nozzle at the top of the drum in addition to the turbo wash nozzles to rinse your clothes during the rinse cycle. A good rinse is key to removing soap residue which will keep your clothes smelling fresh. Now that the rinse cycle is over the washer begins one of those six washing actions known as filtration. This removes the majority of the water before the spin cycle begins. This helps better distribute the clothes in the drum. There have been times when the washer begins the spin cycle but isn't happy with the distribution of the clothes because of the amount of shaking. It then stops, redistributes the clothes and begins spinning again. The washer also uses bearings inside of the drum lining to offset uneven loads. Now if you wash a rug by itself it's not going to be able to offset that and you're going to get an uneven load error. In just a moment we'll take a look at a free app that LG has that helps you to determine what those error codes mean and also diagnose other problems should they arise. Front loaders are known for their intense spin cycles which remove the majority of the water from the clothes. However they're also known for being extremely loud and shaking the entire house. And although the drum itself can shake violently, LG has put a lot of effort into adding springs and shocks throughout the body to absorb that. I've been very impressed with the results. This isn't the early days of front loaders where you're not allowed to put the washer on the second floor because of how violently it shakes. This washer is very quiet and it doesn't dance around your laundry room like previous models. And when the cycle is complete on the washer or the dryer you get this happy little song. This is much better than the annoying buzz on old style washers. Now let's take a look at capacity. After all that would be the main reason you'd buy this washer. LG claims that you can wash a king comforter along with all the bedding. And while that is true I wouldn't recommend it. The more room the laundry has to move around in the drum the better wash you're going to get. For demonstration purposes I loaded a king comforter, the fitted sheet, the flat sheet, and just for good measure a second king comforter. Now again, I wouldn't recommend this, but this is just to show you the sheer capacity of the drum. It can definitely wash your king comforter alone and it's saved us a ton of time by cutting our number of loads in half. Another really helpful feature is the sanitary cycle. LG uses the hot water supply in addition to heating elements in the washer to make the water extra hot. This is really helpful for sanitizing clothes or bedding. The door will lock during the cycle like always, but on this cycle it will not allow you to open the door until the washer has cooled. Another common problem with front loaders is mildew build up around the seal of the door. We've had this washer for a little over six months and haven't cleaned it at all and there’s very little mildew. We are on county water so if you're on well water you may see different results. However LG has a tub clean cycle that we'll look at later that helps address this as well. And as you might expect the stainless steel drum doesn't experience any problems with mold or mildew. The primary way to prevent mildew buildup within the washer is to leave the door slightly ajar so it can dry. LG recommends you wipe down the inside of the door and the seal after every wash but no one's going to do that. A more realistic option is a magnet stopper that LG's added to hold the door closed while keeping it slightly ajar. In addition to that LG recommends you run the tub clean cycle once a month. I think that's a little too frequently, but I did clean it once as part of this review. The washer came with coupons for tub cleaning solution from tide. It's really important that you add the solution directly to the drum and not to the soap dispenser. I will mention that the smell of this cleaner was a little overwhelming and remained in our laundry room for a couple of days. Once the solution is in the drum you simply select the tub clean cycle and then press start. The display shows tcl for tub clean. Once you press start it's going to begin like every other cycle with the load sensing process. It wouldn't surprise me if LG does this to make sure you're not putting clothes in and inadvertently selecting the tub clean cycle. Once the tub clean cycle completes you're going to want to be able to open the door afterwards to let it air out. It's not a bad chemical smell but it was an overwhelming smell that lasted for a few days. The tub clean cycle is going to take about an hour and a half to complete. When your washer holds the world record for capacity, you're going to need a dryer that can keep up. This is the matching 9 cubic foot mega capacity dryer. This model is electric but LG makes a gas model as well. Let's take a look at a few of the features this dryer has to offer. As with any dryer, it's critical that you clean the lint filter at the beginning of every cycle. This not only helps with efficiency but also with safety. This lint filter is designed a little differently in that instead of a rectangular lint filter that the air is passing through it's more of a basket that the air is forced inside of and then passes through. It's really a neat design and prevents lint from building up on the exterior of the dryer when you remove the filter. It's also very easy to put in and take out. When using the cycle selector regardless of how quickly you turn it it's only going to move so fast. This is the case for the washer as well. So if you're choosing one of the cycles near the end of the dial it can be a little frustrating. LG has addressed this by putting the more frequently used cycles near the top. In addition to that using the custom program feature will eliminate a lot of that headache. One of the more popular features of this dryer is its ability to use steam to remove wrinkles from clothes. Let's pretend that you just pulled a shirt out of your closet to wear and it's a little wrinkled. Or maybe you're like a lot of people and just don't like to iron. Just throw the shirt in the dryer and choose the steam fresh cycle. You can then use the display panel to adjust the cycle for the number of garments. You can choose between 3 garments, 5, or big. These are your only choices and for only one shirt you’d choose 3. Then you press start. The cycle begins by heating water that is drawn in from the reservoir. It also tumbles the shirt on whatever temperature you've selected. I've had pretty good results with this cycle but it's not going to be as good as your trusty iron. In addition to this cycle you can also add steam to the end of almost any cycle to remove wrinkles. And although I didn't mention it, the washer also has a steam option that you can add to almost any cycle as well. You add water to the dryer by simply pouring it through the screen filter on the top of the reservoir. LG recommends tap water and says that using distilled water will cause problems with the dryer's sensors. The orange nozzle in the rear is where the steam enters the drum. I have noticed a few drops of water coming from this but for the most part it seems to do a really good job at producing steam and sending it into the dryer to remove wrinkles. Pulling out the shirt after the cycle completes reveals a shirt with no major wrinkles. Again, this won't replace your iron but is handy in a pinch. 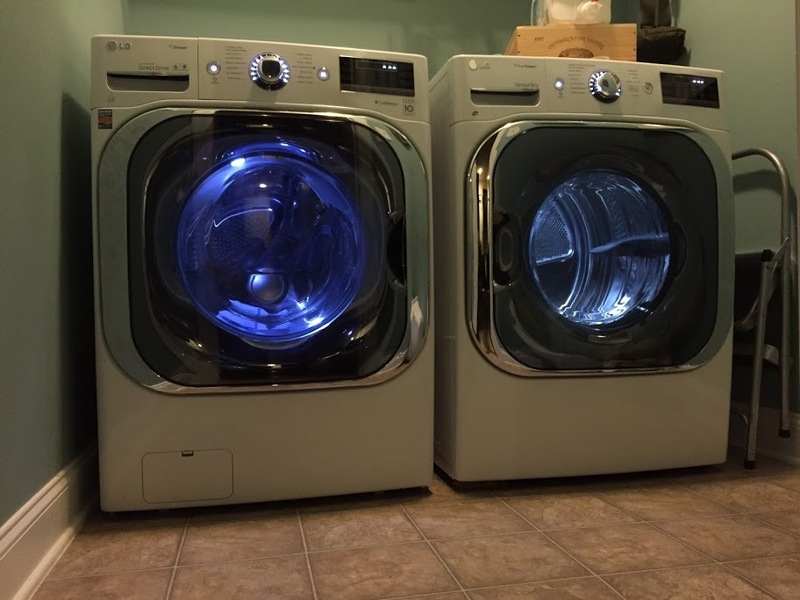 As far as the size of these units they're essentially the same width as any standard washer and dryer. They're just a little deeper. But make sure you measure your laundry room before purchasing. LG has implemented a really innovative way to read error codes from their appliances. It's called smart diagnosis. It uses a sound similar to a modem or fax machine to transmit data to a smartphone, tablet, or over the phone to an LG support specialist. On this washer you get started by pressing the wash temp button for three seconds. It then begins a countdown and starts playing the sound that will send the data to the app. LG has this across many of their appliances and it seems like a great way to diagnose an issue. In my test once the diagnosis was complete the last status of the washer was "cycle complete”. This is normal operation so there's no solution. I have used this in the past though when I received a vague UE error to determine that the problem was an uneven load. For families with small children the front loaders are perfect. Not only can the children help out with laundry since they can reach the drums but you also don't have to worry about a child falling inside of a top loader or being able to open the door during a wash or spin cycle since the washer door locks shut with every use. Additionally both units have a child lock that renders the controls unusable until unlocked. As with anything, certainly supervise your children while they're around appliances. Take my word for it, you won't be disappointed. We bought the pair mainly for their capacity but have been really impressed with the improvements that LG has made since our last front loader six years ago. The units are much more efficient, much quieter, and definitely don't vibrate as much. In the end though, it does come down to capacity. I'm sure there are other LG front loaders on the market that have similar features. But if you have a large family, kids that get their clothes dirty frequently, or are washing bulky large items like comforters and sleeping bags you should definitely consider these. The old saying that you get what you pay for holds true here. I've been very pleased with our purchase and would highly recommend this washer and dryer. If you have any questions that I didn't cover feel free to leave them in the comments. How do you like this set after owning them for almost a year now? I'm still just as satisfied as I was on day one. The units have functioned perfectly for us with no problems at all. If I had it to do over again I'd buy this same pair without hesitation. are the washer and dryer stackable on top of each other? I saw another video review where the person demoing the washer said that small items (kids socks and such) can move outside of the wash bin and become trapped in the door seal. Have you run into this problem with your washer? We wash a lot of small kids clothes and haven't had that issue at all. We did once close a sleeve in the door which broke the seal and made it leak water. Once we figured that out though and moved the sleeve it was fine. Otherwise, we've never had that issue. Now that you have had this washer for over 3 years, will you please provide an update on the mold/mildew build up? Thank you. JJ, I just watched your review video of the LG 5.2 CF Washer WM8100HVA and I was very impressed with it. It pretty much sold me already. So, if you don’t mind, could I ask you a question about the washer? We currently have a 7 year old Maytag 4.5 cf top loader and we are the proud parents of two black Laborers and one cocker spaniel, we vigorously shake everything outside before putting it in the washer but always, after each wash, we must wipe all along the top and inside the basket to remove the dog hair. I would assume that most the hair would be washed out, but no. How is this washer for cleaning dog hair off the items being washed and leaving hair in the washer. I understand that you might not have dogs so if not, could your readers help me out. Again, I appreciated your informative video and look forward to seeing your other ones. @Michael T W - When we had dogs they were outside and we didn't really wash dog related things in our washer. That being said, someone just recently left a comment on the YouTube video saying that they have dogs inside and also have this set and it works fantastic. You should scroll through the comments on the YouTube video and see what others have to say. Thanks for your kind words about the video. @Anonymous - We don't really have mold/mildew issues. We do leave the door open when not in use. I did just recently clean out the seal around the door opening and there was a little mildew in there, but nothing terrible. Probably if you cleaned it out once a year you'd be ok. Very useful information. Iron dryer is a new innovative dryer which comprises of Iron. This device dries the wet clothes within few minutes. At the same time it removes the wrinkles of the clothes. So it helps us for saving the ironing time.Its basically producing steam which removes the crinkles of the clothes. I was recently asked by one of our VP’s to investigate a way for people who are at a remote location to participate in a presentation at our corporate office.My first thought was video conferencing, but video wasn’t necessary because participants didn’t need to see each other.The only real requirement was to see the presentation slides and hear the presentation audio.Since we have a Cisco Meetingplace server I figured that would be easy.The challenge was the VP wanted the presenter to be heard clearly and not have to speak directly into a phone.He suggested we find a wireless lapel mic.